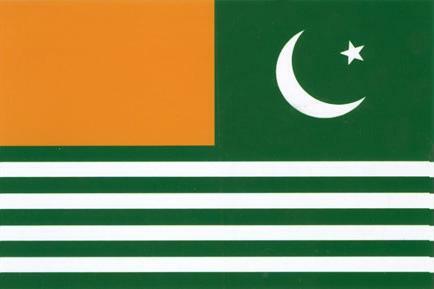 The official flag the State of Azad Jammu & Kashmir was adopted on 24th September 1975. The flag was adopted by the passing of the Azad Jammu and Kashmir State Flag Ordinance, 1975 by the then president, Sardar Muhammad Ibrahim Khan. Three Fourth green background represents 75% Muslim population of the State of Jammu and Kashmir. One-Fourth Orange (Golden) colur represents 25% minorities of the State of Jammu and Kashmir. The Green stripes represent the Valley of the State of Jammu and Kashmir. The White stripes represent the snow-covered mountains of the State of Jammu and Kashmir.